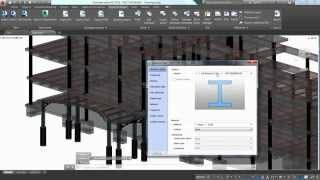 With Advance Steel 2016 Extension, Autodesk® Revit® 2016 users can quickly connect their models to Advance Steel 2016 using the export, import, and synchronize functionalities to transfer the model BIM data. This interoperability allows users to rapidly produce general arrangement drawings, fabrication drawings, BOMs, and NC files for steel structures. The synchronization of BIM data between applications allows the user to update the modifications without having to reimport the entire structure. Synchronization also reduces the risk of potential errors by offering the possibility to track changes made on the same model in different applications. Using Advance Steel 2016 Extension, the BIM data from the Revit model can be imported or exported also in other formats such as SDNF (Version 2.0 and Version 3.0), CIS2, IFC, and PSS. Thanks for answer Irina. But maybe somebody knows another exporter or way how to achieve CIS2 Design format in Revit 2016? Thanks. Hello, are previous versions of Autocad compatible with this add-on? Thanks. I can't install, it appear "Revit is not present" when i install the extension. What can I do now ? When there will be for 2017 version? will it export to advance Concrete 2016 ? Мне понравилось это приложение, удобный экспорт и интерактивность, при проектировании промышленных объектов просто незаменим! Only SDNF can export ! Thank you for contacting us. We are working to identify the reported issue and contacted you via email for further details.Best regards. Now After contacting the Publisher I must be honest now to say that the tool is working well and perfect 100%. Thanks for fixing .. The same problem for me. I'm able to export as SDNF, but when I select CIS/2 or IFC for instance, there is no file at the end. The same problem for me. I&#39;m able to export as SDNF, but when I select CIS/2 or IFC for instance, there is no file at the end. I am unable to install, i allways got error - revit 2016 not found, even I have Revit 2016 installed. When you install an application error occurs "Revit 2016 is not present"